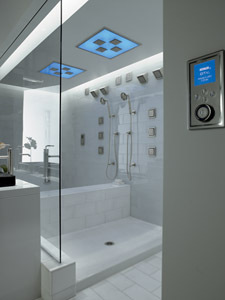 The Kohler DTV II brings innovative digital technology to the shower. The DTV II provides homeowners with a custom shower experience, enriched with a custom digital hydrotherapy system controlled by a single, easy to use digital interface panel, which is available in Matte Chrome with Polished Chrome, Matte Nickel with Vibrant® Polished Nickel, and Matte Gold with Vibrant French Gold finishes. The DVT II can accommodate up to eight showerheads for an ultimate hydrotherapy experience. You can set your DTVII to provide personalized showering experience. Each person who uses the shower can program his or her showering preferences, which can be activated simply by pressing a button. Bathers can enjoy a complete sensory experience every time they shower, with the combination of steam, ambient lighting, and music (via the behind-the-wall media system and KOHLER SoundTile™ waterproof speakers). Users can enjoy chromatherapy, which has previously been found only in high end whirlpools. The DTV II incorporates chromatherapy the shower experience via the WaterTile Ambient Rain, which enhances the shower experience via ambient light patterns. The user can select colors or enjoy one of th preprogrammed sequences. WaterTile Ambient Rain is a lighted square ceiling panel that includes four adjustable body sprays. For more information, see www.KOHLER.com or call 1-800-4-KOHLER. Kohler was founded in 1873 and is headquartered in Kohler, Wisconsin.